On the matters arising from the court sitting of 17th October, 2017 where the case of treasonable felony instituted by the Nigerian government against Mazi Nnamdi Kanu and the other three defendants resumed hearing, Justice Binta Nyako, the presiding Judge once again demonstrated a high class level of judicial stupidity where she obviously declared that she does not care whether the person she granted bail to, has been killed by the Nigerian Army, who invaded his residence, or not. During the court proceeding, the trial Judge asked about the whereabout of Nnamdi Kanu, the first defendant, who was absent in court. We saw the videos where the Nigerian army, probably on the firm instruction by the Nigerian government, invaded his home on September 14, 2017. The news making round is that the military took him away and there is an iota of truth in those reports because since the military invasion, young Kanu has not been seen anywhere again. From the videos also, the military massacred many others in his compound and bushes because there were corpses littered in Kanu's compound and those drowned in the mud. 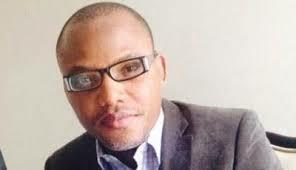 Barrister Ifeanyi Ejiofor, the lawyer to Mazi Nnamdi Kanu narrated in court, how the Nigerian military invaded the residence of Nnamdi Kanu with armoured tanks, killed 28 persons, probably kidnapped Nnamdi Kanu and his parents to unknown destination. However, as I read through what transpired in the court, I realized that the high point of Justice Binta Nyako's stupidity was when she declined any response on the fact that a report was submitted to her about the military invasion of the person whom the court granted bail to. It is on this judicial stupidity demonstrated by Justice Binta Nyako that I hereby call on the Nigerian Judicial Council (NJC) under the chairmanship of Hon Justice Walter S. N. Onnoghen to as a matter of urgency call Justice Binta Nyako to order over her reckless demeanour and utterances. To the best of my knowledge in this matter and as a human right activist, human right legal aid, the Nigerian Federal High Court and the National Judicial Council (NJC) as an institution, including Justice Binta Nyako who is the presiding Judge over this case, were the first set of people responsible for the inability of Nnamdi Kanu to have run for his life. It was obvious that his life was in danger as at September 10th, 2017. There was a failed attempt to assassinate him by the Nigerian army. The assassination attempt by the military was also captured in videos. It was an undeniable fact. If the NJC had not connived with Justice Binta Nyako of the Nigerian Federal High Court to sieze Nnamdi Kanu’s international passport as part of the conditions to his bail, he would have escaped the Nigerian military invasion of September 14, 2017 where he was captured and probably killed by the military. He would have still come to court no matter where he would have been in the world. The siezure of his passport by the court rendered him incapable of running out of Nigeria for escape even when faced with imminent danger from the coded "Operation Python Dance". Now, that the army has taken Nnamdi Kanu to an unknown destination and probably killed, Justice Binta Nyako should note that if she does not make haste to bring the Nigerian army to account for the whereabout of Nnamdi Kanu, she risks putting NJC into a big mess because her obnoxious bail conditions rendered Nnamdi Kanu incapacitated and immigrationally disabled to travel anywhere because of global knowledge of his personality by virtually everybody in the world but he could not have hidden or ignored his court case. It is important for NJC to make the judicially gullible Justice Binta Nyako to understand that whenever a defendant is granted bail, the person automatically becomes the property of the court which the court is part of the parties responsible for accounting for the security of the person. The fact that Justice Binta Nyako does not know that the failure of the Nigerian army to produce Nnamdi Kanu to court portrays dangers to herself and NJC because she granted the stringent bail which stripped Nnamdi Kanu of his travelling documents thereby made him unable to escape even when it was very obvious that he was to be attacked by the army. This speaks volume of the fact that Justice Binta Nyako is not qualified enough to be a Judge because she ignored such a serious report that a defendant she granted bail was invaded, attacked, captured and probably killed by the military agents in the case she preside over. Nigeria Judicial Council should know that if Justice Binta Nyako fails to invite the Nigerian army to explain where they took Nnamdi Kanu to, NJC risks being called by the world to account for the whereabout of Nnamdi Kanu at the fullness of time. Justice Binta Nyako goofed big time and risks loosing her judicial career for describing the report by Nnamdi Kanu's lawyer of the military invasion of Kanu’s home and capturing as a needless story and drama. I want NJC to know that Justice Binta Nyako has brought a serious trouble to them by being pressured by the Nigerian government to strip Nnamdi Kanu of his international passports which could be translated into a conspiracy to eliminate him outside Kuje prison because they found it difficult to assassinate him while he was there. As a matter of urgency, the Nigerian Judicial Council should save herself of the dangers ahead over Nnamdi Kanu’s captivity with the army by calling Justice Binta Nyako to order now.